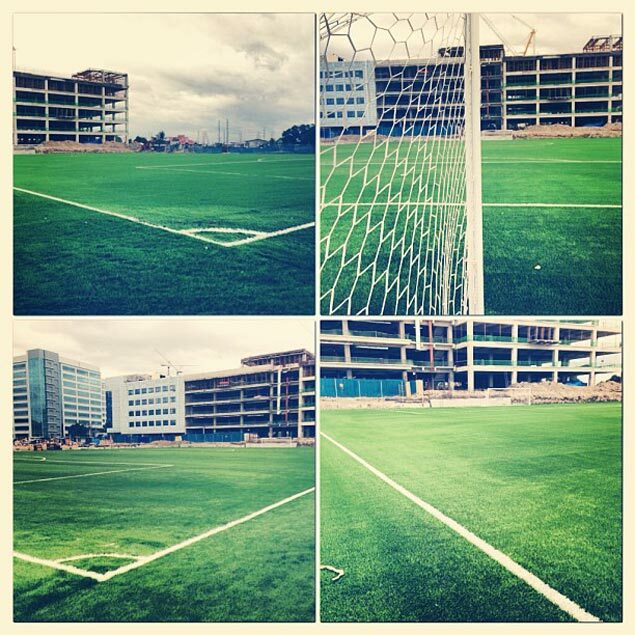 Photos of the Mckinley Hill football field posted by UFL chairman Santi Araneta on his Twitter account. THE United Football League finally has a field it can call home. Santi Araneta, the UFL chairman, on Wednesday announced the completion of the Mckinley Hill football field in Taguig, an all-weather artificial pitch that will help smoothen the league schedule for the coming new season. Araneta made the announcement through his Twitter account. “We don’t want to have dependency on the schedule. There will be less cancelation of games this time,” said Araneta later in phone conversation with Spin.ph. In the last UFL Cup, numerous games had to be cancelled due to the unavailability of the Rizal Memorial Stadium or the sogginess of the University of Makati pitch caused by heavy rains. "We won’t have problems anymore. Expect better quality football," said Araneta, the CEO of LBC Express. The $1-million pitch, built in partnership with Megaworld Corp., began construction eight months ago and is up to Fifa standards. Araneta said the UFL will have temporary bleachers in time for the league's resumption on February 5. The grandstand, which has a target seating capacity between 2,000 and 4,500 people, will be available in June.